It was a chilly start to a January Saturday morning, but with sunshine and unseasonably warm air in the forecast, I knew the frost was going to be long gone by the time we got to our destination. My friend Kim and I were on our way early that morning to Leadwood, MO between Park Hills and Potosi, to meet up with various Missouri Stream Team volunteers for the Big River Tire Round-Up, put on by Sam and Jill and the dedicated members of the “Big River Baggers”, Stream Team #4169. The Big River, looking upstream from the Leadwood Access. Arriving at the Missouri Conservation Department’s Leadwood Access around 8:30 am, Kim and I had some time to wander around and take pictures of the water and ice of the Big River, flowing through an old concrete culvert dam, before meeting Sam and some other people around 9 am. It was enriching to take a few minutes and soak in the morning air. We all tend to visit rivers more often in the warmer months, so we can miss out on a different perspective that happens, as they take on a significantly quieter and peaceful nature in the crispness of wintertime. This morning was no exception. 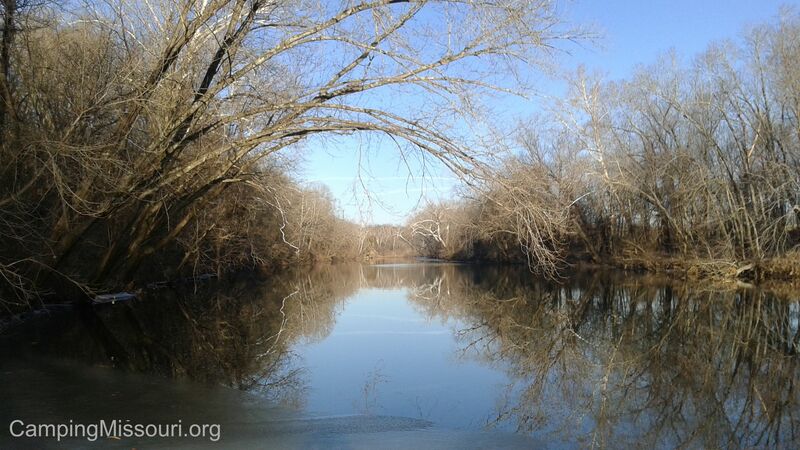 With a surface as smooth as glass, extending silently upriver to the next bend with a flawless reflection of the naked sycamores looming over it. Great skeletons of trees, peering down at themselves in the sunlight, enjoying the quiet and dreaming of the growth yet to come once springtime finally arrives again. It was good to witness the whole reason for us being there that morning. Once everyone that was going to help out had gotten there, we caravanned down Route 8 just a bit farther, headed down a hill, drove past a field of sheep sleeping quietly next to a farm pond, and then down through the woods and onto the farmland where we would be hunting tires today. After a safety talk and an explanation from Sam about the objective of the day, we headed out across the field to the treeline along a little tributary stream of the Big River. We were looking for tires, and as we neared the longer, laid over grass just before what looked to be an old farm levee, that familiar round silhouette started to come into view, scattered here and there on the ground. 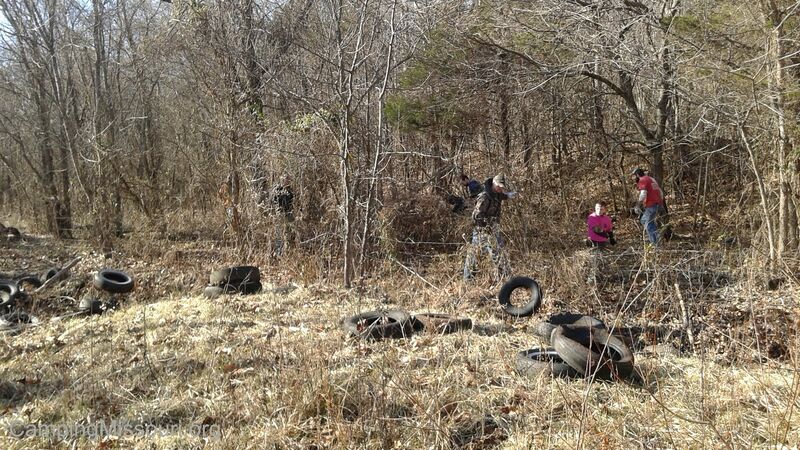 The hardworking volunteers started moving as a group into the woods, scrambling between the trees, pulling tires out of the briars and leaf litter. Abandoned rubber donuts everywhere, partially frozen in the ground, waiting for the afternoon sun to warm them as they lay there. We fell into a system of moving forward, popping them loose, and then carrying them two at a time (SOME people carrying up to FOUR at a time!!!) over to the nearby fence line where ATVs pulling trailers would load them up and drive them to a central pile. An army of Stream Teamers…dedicated and focused. Men, women, and children, working our way through the woods along this stream, scouring the forest floor and waterway for all the tires we could find; none of which belonged there. After about an hour or so we had found all the tires that were out there on that side of the road, so we regrouped and worked to load the final piles we had collected onto the trailers to move them to the main pile. It was then a walk back across the field to the charcoal grilled hot dog lunch and bonfire that was set up. Not bad for a quick run through the woods. 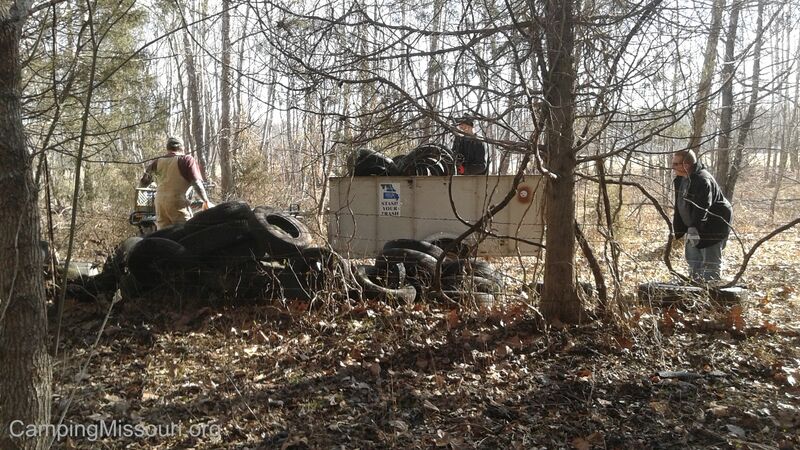 After a bit of food and socializing and a raffle drawing, we made our way up the road and gathered all the tires that were in the woods on the other side, just along the Big River. Not as many as we had already found that morning, but certainly a large amount that also didn’t belong in there. 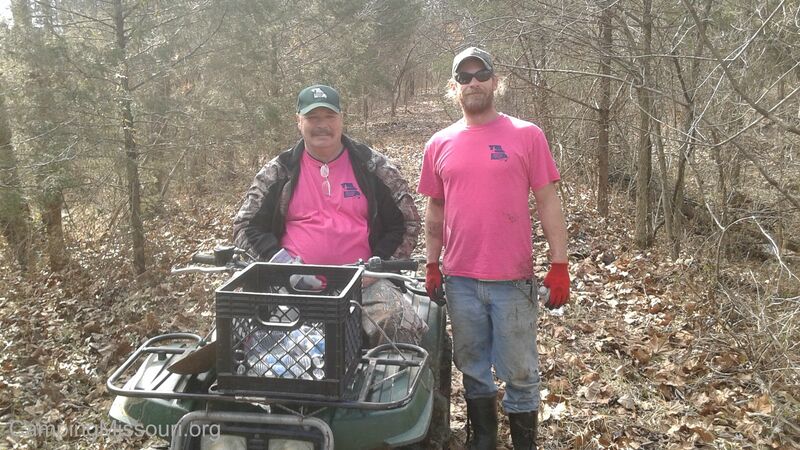 Sam has been a Missouri Stream Team member for a long time, focusing primarily on the Big River, when he isn’t helping out other teams somewhere along THEIR waterways. He told me of how in past floods, this farmland we were on was completely submerged by the overwhelming levels of rising water. 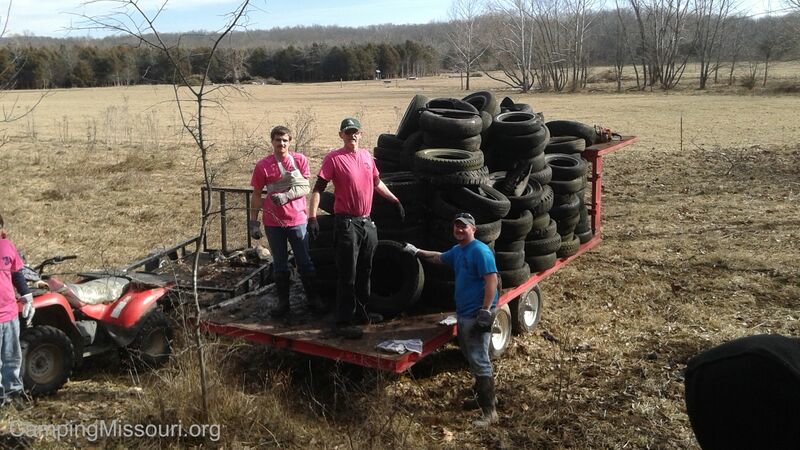 Being against a significant curve in the river, and compounded by the people who over the course of time have made the disrespectful decision to dump garbage, it is no wonder that we found as many tires as we did. The estimated number before the round-up was 1200 (!!!!! ), and I don’t know what the official count turned out to be…but a Saturday morning volunteering with the Big River Baggers of Stream Team #4169 and the other Stream Teams that joined all of us certainly had a huge beneficial impact on the health and beauty of a little out of the way farm, nestled in a valley along a curve of the Big River in Leadwood, MO. An amazing group of Stream Teamers! 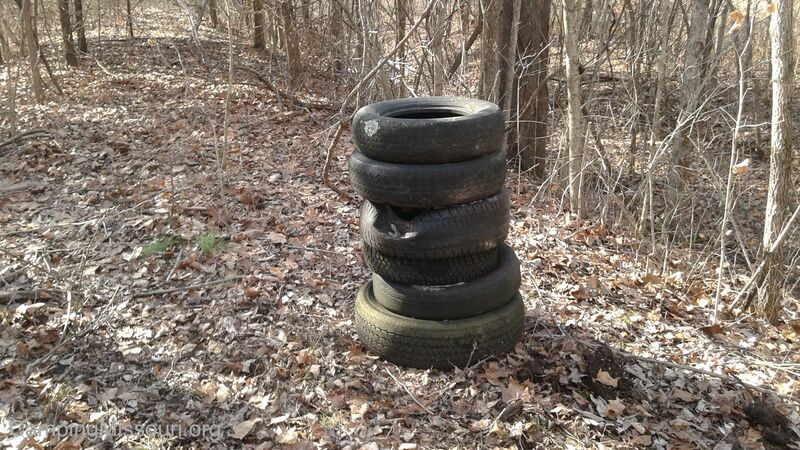 What always astounds me, beyond the question of “Where do all these tires come from?! 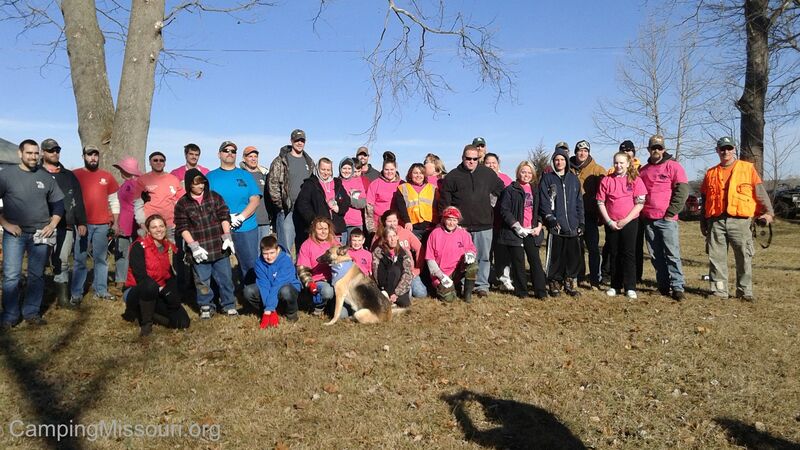 ?”, is how quickly a group of rabid volunteers can head into the forest and change it for the better. Thank you to Sam and Jill and all the great people I am lucky to know that came out to help that morning. I look forward to next time! If YOU want to start having Missouri Stream Team adventures of your own, go to http://www.mostreamteam.org/ and check out their calendar of upcoming events and/or contact them about nearby teams or starting a team of your own. It really is a lot of fun, and YOU ought to get involved!